Hallux Valgus (also referred to as a bunion deformity, or bunions) is often described as a bump on the side of the big toe. But a bunion is more than that. The visible bump actually reflects changes in the bony framework of the front part of the foot. The big toe leans toward the second toe, rather than pointing straight ahead. 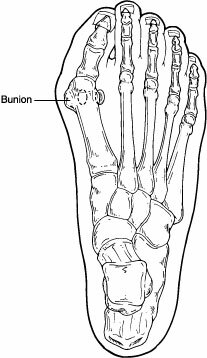 This throws the bones out of alignment—producing the bunion’s bump. Hallux Valgus is a progressive disorder. It begins with a leaning of the big toe, gradually changing the angle of the bones over the years and slowly producing the characteristic bump, which becomes increasingly prominent. Symptoms usually appear at later stages, although some people never have symptoms. Even though Hallux Valgus is a common foot deformity, there are misconceptions about them. Many people may unnecessarily suffer the pain of bunions for years before seeking treatment. Hallux Valgus is most often caused by an inherited faulty mechanical structure of the foot. It is not the Hallux Valgus itself that is inherited but certain foot types that make a person prone to developing Hallux Valgus. Hallux Valgus is readily apparent—the prominence is visible at the base of the big toe or side of the foot. However, to fully evaluate the condition, the foot and ankle surgeon may take x-rays to determine the degree of the deformity and assess the changes that have occurred. Because Hallux Valgus is progressive, they do not go away and will usually get worse over time. But not all cases are alike—some bunions progress more rapidly than others. Once your surgeon has evaluated your bunion, a treatment plan can be developed that is suited to your needs. Sometimes observation of the Hallux Valgus is all that is needed. To reduce the chance of damage to the joint, periodic evaluation and x-rays by your surgeon are advised. If nonsurgical treatments fail to relieve Hallux Valgus pain and when the pain of a bunion interferes with daily activities, it is time to discuss surgical options with a foot and ankle surgeon. Together you can decide if surgery is best for you. 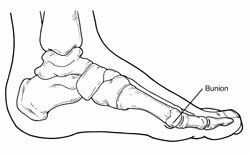 A variety of surgical procedures is available to treat Hallux Valgus. The procedures are designed to remove the bump of bone, correct the changes in the bony structure of the foot and correct soft tissue changes that may also have occurred. The goal of surgery is the reduction of pain and deformity.